The BMW 3 Series sedan has been completely redesigned for the 2019 model year. As we previously covered, the 3 Series has carefully evolved throughout the decades and has traditionally placed an emphasis on sporty driving dynamics, technology and crisp design. Styling has generally been conservative, and the seventh-generation model carries on that theme. The exterior is handsomely rendered and features luxury styling cues, like chrome window surrounds, combined with aggressive bodyside sculpting and an integrated decklid spoiler. It all makes for an assertive, yet restrained design that’s distinctively European. It strikes a balance between the swishy Mercedes-Benz C-Class and somewhat cartoonish Lexus IS. 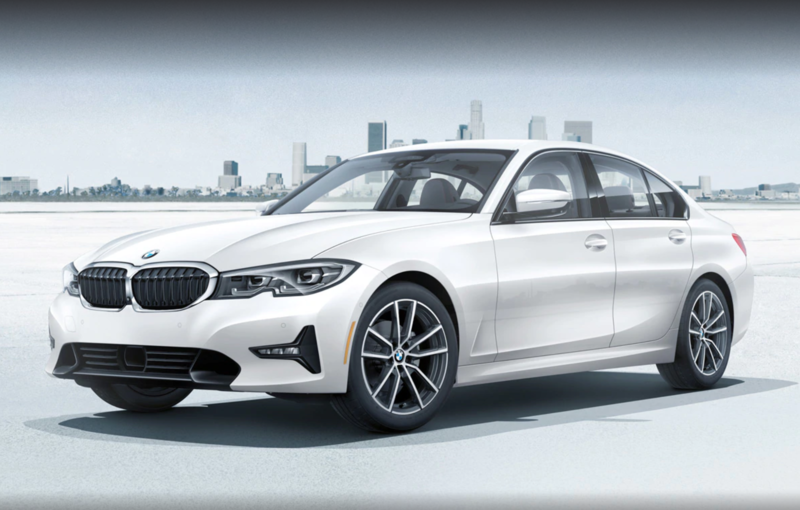 The 2019 3 Series sedan is lower than its predecessor and that makes for a more grounded appearance while also paving dividends when it comes to handling. In terms of driving dynamics, initial press coverage reports that BMW has put extra effort in to make this generation 3 Series a more enjoyable drive that its predecessor. Within the auto enthusiast sphere it has been widely suggested that the 3 Series softened over time and lost its razor-sharp performance, so it’s reassuring to learn that BMW may have taken the feedback to heart and righted the ship. Unfortunately, a manual transmission is no longer offered, which is sure to disappoint some loyalists. Now that we’ve touched on the heritage, design and dynamics of the all-new 2019 BMW 3 Series sedan, lets build one to find the best combination currently available. We’ll begin under the hood. For the initial launch BMW is only offering the 330i equipped with a 2.0-liter turbocharged inline 4-cylinder engine. It’s good for 255-hp and a respectable 0-60 mph time of 5.6 seconds in rear-wheel-drive form. While, all-wheel-drive is available, we’ll forgo it to save a bit of coin and also stick with the traditional driving wheels for the 3 Series. Before destination the price is $40,250. While it’s easy to go overboard when outfitting a BMW, we’ll be pragmatic with this build so as to combine the best elements for most drivers without an exorbitant final price. Shoppers must select one of three design trims on the 2019 BMW 3 Series sedan. The standard Sport Line comes with chrome window surrounds and features black high-gloss trim on the bumpers. It makes for a nicely balanced look between upscale and performance. The glossy black trim is replaced with chrome accouterments in the Luxury trim level, which, although unoffensive, don’t quite fit the character of the car as well and seem tacked on. The top-level trim in terms of price is M Sport, which has gloss black window surrounds, larger wheels and other details, but will set you back a cool five grand. The standard Sport Line does a good job of blending the best elements of both trims together and comes with attractive standard wheels, so we’ll go with that and proceed to the next stage. Lighter colors nicely set off the deep bodyside and hood sculpting. Alpine White looks excellent on the new 3 Series. However, darker colors contrast with the Sport Design’s chrome trim and nicely set off the chrome grille. Black Sapphire Metallic gives a crisp and classic look to the exterior, slightly edging out the deep and lustrous Mediterranean Blue Metallic for top dark paint color. We’ll now step inside to admire the modern and clean design. BMW did a nice job of injecting some excitement into the cabin and it has a very upscale look that coveys solidity. From the design of the 14-way power seats to the metal and wood accents that adorn the dashboard and doors, there’s a strong sense and craftsmanship. While all of the interior colors on offer look very nice, it’s high-contrast Oyster leather combined with black carpeting and trim that has the sharpest appearance. Well worth the upgrade, the lovely Oyster color is only available with leather upholstery which costs $1,700 over the standard SensaTec, which is BMW speak for pleather. Next up, let’s have a look at the packages and options. Choose the $2,150 Convenience Package for its lumbar support, keyless entry including hands-free trunk opening, SiriusXM Satelite Radio and active blind spot detection. This is a well-rounded package that equips the 3 Series with features that should really be standard. The Premium Package brings with it niceties such as a heated steering wheel, navigation system and large 12.3″ infotainment display, among other features. There are several stand-alone options that are worth checking off the list. For optimal sound quality the $875 Harman Kardon surround sound system has 12 speakers, including two central bass speakers located under the front seats. A $500 wireless phone charging tray adds convenience and can be had with a WiFi hotspot. That brings our grand total for this well-equipped 2019 BMW 330i to $49,520 including destination. So here we have it, a 2019 BMW 3 Series with a great color combination and packed with all of the must-have features, all for under fifty grand. The Mercedes-Benz C-Class will set you back just about as much, while the Lexus IS and Audi A4 will come in slightly less expensive once optioned up comparably. With fresh styling and a refocus on performance, the 2019 BMW 3 Series sedan is an appealing choice for shoppers looking for a luxury compact sedan that’s fun to drive and sharply designed.